This offer consists of 5 x Novin Saffron 20g Value Tins. The Novin Saffron 20g is contained in a sturdy resealable metal tin that will perform in the bustle of a busy kitchen. Each value pack will yield well with heavy use and the 100g offer suits the commercial kitchen, hotel, or caterer. The grade on this saffron is grade 1 under ISO 3632 (the International Standard for Saffron Grading) and it contains 100% saffron stigmas. Colouring and flavour are superb. It is a more concentrated saffron than its European cousins because it is sun dried until brittle rather than oven dried or dehumidifed. Our Novin Persian Saffron is imported direct from Iran, and is from the 2017/18 harvest making it the freshest saffron available. 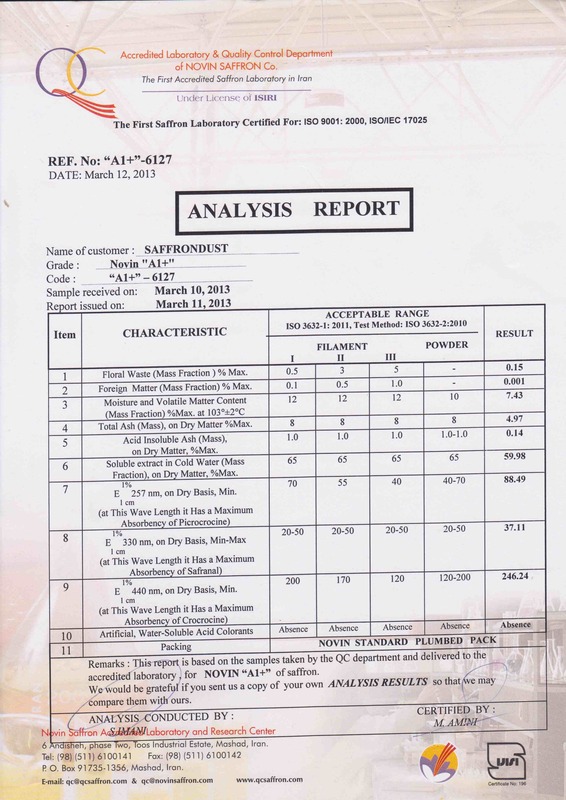 Lab analysis showing batch test results against ISO 3632 can be viewed here. As with all of our products, shipping is free to Australian addresses. Interested to learn more about Saffron ? Sign up to our member newsletter ! You’ll benefit from member-only news, recipes, articles and special offers! As we use saffron for medical purposes, it was essential we received the very highest quality saffron available. The stigma's we purchased from SaffronDust has met every requirement we had, so we have re-ordered from them and will continue to do so. We are very satisfied with the quality of the product and the speed with which it was delivered to New Zealand. Top marks. Click the button below to add the 100g Novin Grade 1 Saffron - 5 x 20g Value Tin to your wish list.